Fresh unpolluted air untouched snow crystals glistening in the sun, birds chirping and snow swishing underfoot, gentle cooling breeze and cold hydrating water make getting out into the backcountry a sensational experience. Trekking up a mountain in order to ski an untouched run, or just getting out into the country can bring the exhilaration and adrenaline back to skiing, reviving us after too many long lift lines and crowded runs. Resorts in much of Europe are based around villages and offer unlimited access to surrounding mountains and backcountry skiing. Nordic skiers call heaven Innsbruck, Austria. Surrounded by hundreds of miles of cross-country trails that take skiers through quaint villages or into the backcountry, it could take a lifetime to ski all that Innsbruck offers. The Buchen Loop, beneath the 8,800-foot Hohe Munde, takes skiers onto a plateau overlooking the whole Inn Valley. Nearby Kirchberg has 100 miles of cross-country tracks and neighboring Kitzbühel has 50 miles more, add that to Seefeld’s 200 miles of groomed trails through pine forests and meadows and you might never come home…on purpose. 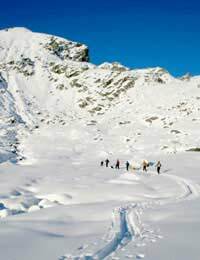 If that’s not enough, backcountry trials abound in the Lech Valley and expedition skiers may enjoy the more difficult trails from Zürs to St. Anton. Likewise, great terrain proliferates throughout the Alps for backcountry adventurers to explore. In Switzerland, the Jungfrau region including Wengen, Murren and Grindelwald as well as Engleberg and St. Moritz offer amazing views and extensive trails. Check out the Brixen-Bressanone region in the Dolomites of Italy or Garmisch-Partenkirchen in Germany. There’s even Spain’s Baqueira-Beret that provides access to the great backcountry on and around the Pyrenees’ tallest peaks. Canada’s backcountry skiing is arguably the best in North America, because it combines amazing snowpack, diverse terrain and accessibility. Canadian backcountry slopes are more stable than the Colorado Rockies and more expansive than Wyoming’s Tetons. Backcountry riders looking for a day trip can access 11,000 ft Mt. Hector, in Banff National Park from the highway. The Purcell Mountains require several days of trekking to reach but are worth the work. With the numerous ice fields in Alberta producing enviable snowpack, British Columbia’s twenty-five wilderness lodges open to backcountry explorers and numerous powder havens all over the Canadian Rockies, Canada a great place to ski. Cross-country skiing can be found all over the northern US; however, some of the most scenic and geographically impressive trails are in the National Parks. Yellowstone, Yosemite, Glacier and Grand Teton encompass diverse terrain and ecologies within their own boundaries. Guides in Yellowstone take skiers through the meadows of Cascade Creek, to hot spring basins, along the rim of the Grand Canyon of the Yellowstone, and down the slopes of the Washburn Range. Glacier National Park’s surrounding peaks and quiet solitude provide a great setting to clear your mind, explore your soul and get aerobic exercise. Yurt or hut tours provide access deeper into mountain trails; most snowy states have their own systems. In Australia, cross-country skiing is a favorite of outdoor recreationists with most of New South Wales, Victoria and Tasmania protected by National Parks. Mt. Buffalo, Kosciuszk (home to the Snowy Mountains) and Alpine National Parks are only a few of the natural wildness areas in Australia, but they offer many kilometers of trails with beautiful views for cross-country explorers. New Zealand’s Canterbury region, home to the spectacular Northern Two Thumb range varies in backcountry powder runs from steeps and chutes to wide-open bowls. Guides know the places to go and can safely deliver you to the best powder stashes all over New Zealand. The Meg River Valley offers 55km of groomed cross-country trails in the Pisa Range and a 40 hut system provides shelter throughout New Zealand’s Southern Alps. Guided trips allow access to more backcountry lines, with the advantage of local knowledge. Guides know the regional rules, where the best snow is and the perfect terrain for your ski style and ability. Having someone who speaks the language and knows people in the area can be comforting. Many companies like Endless Turns, take skiers to the great ranges all over the world, including New Zealand’s and Europe’s Alps, the Andes and the Rockies. The other advantage of guided backcountry exploration is catered meals; you get to eat great with someone else cooking! Of course, avalanche safety courses and first aid are a good idea regardless of guided trips. Whether on cross-country or alpine skis, or a combination, getting out into the backcountry exhilarates, giving us clarity and perspective, and allowing us to relax. We can throw ourselves down a wicked chute or spend days on the trail to get our blood pumping, but either way it’s better than spending hours in long lift lines.